There’s a high price to pay for uranium mined on the Colorado Plateau and it has nothing to do with the dollar value. Today, a pound of uranium sells for around $21 — at least $30 dollars less than what some mining companies view as the break-even point. Since the first uranium frenzy about 70 years ago, the market has been in the tank for roughly the same number of years that it has boomed. Historically, the only reliably high price related to uranium is the one paid by the public in the form of tax dollars and public health. The last uranium boom left the federal government and taxpayers on the hook for much of the necessary cleanup. On the Navajo Nation alone, the price tag for the assessment and cleanup of just a fraction of the hundreds of abandoned mine sites that still dot the landscape has reached nearly a billion dollars and it’s still growing. Uranium mill cleanup (not including mines) has been so expensive that, by the year 2000, the Department of Energy estimated it had spent $1.5 billion since 1978. Even then, that number had exceeded what the uranium extracted from the mines was sold for by over 50 percent. A more updated figure is hard to pin down, but we know that one mill site alone — the Atlas Mill near Moab, Utah — is expected to cost around $1 billion by itself by 2032. The Atlas Mill tailings pile, in the floodplain of the Colorado River near Moab, Utah. Radioactive material mobilized by mining into the air, water, or soil can find its way into human bodies and, once there, the consequences are grim. Uranium that is ingested via water or food sources finds its way to bone, liver, kidneys, and soft tissues. Radioactive molecules that are inhaled lodge themselves in the lungs. Once in the body, uranium emits alpha particles, which are readily absorbed and can damage DNA and cause cancer. Scientists have established a well-known connection between uranium exposure and cancer of the lungs, stomach, bones, and blood, kidney failure, and fibrosis. Native American communities have been disproportionately made to pay the health price of uranium extraction. During the first uranium boom that ended around 1980, there were over one thousand uranium mines on the Navajo Nation alone, over 500 of which still remain in need of cleanup today. More than 90 percent of all uranium milling in the U.S. has occurred on or just outside the boundaries of Native American reservations. And today, the last remaining conventional uranium mill in the U.S. — the White Mesa Mill — sits just three miles north of the small White Mesa community of the Ute Mountain Ute Tribe in southeastern Utah. As researcher Anite Moore-Nall has written, “As a result of the mining activity much of the population of the Navajo Nation residing near the areas of mining or milling has had their health compromised.” One uranium mine in Shiprock, New Mexico, for example, employed 150 Navajo miners until 1970. By 1980, 133 of those miners had died of lung cancer or some form of fibrosis. And while mine-worker safety standards have since improved, the industry has yet to demonstrate that its operations won’t still cause environmental contamination, further impacting human health. What’s more, the burden of proof regarding the safety of modern mining operations has been placed on taxpayers, who are left to fund hydrogeological research and the installation of critical monitoring wells near mine sites. If the Grand Canyon region is reopened to new mining claims and mines, the long list of tribal communities whose health could be in jeopardy will grow. Among them, the Havasupai, who live beneath the canyon walls, and the Navajo, whose communities are still reeling from the uranium developments of the past. But if market prices are low, why are we worried? Low prices unfortunately don’t mean companies lack incentive to pursue mining on our public lands. Especially now, the low market value of uranium hasn’t stopped the mining industry from arguing that they need — even that they deserve — more liberal access to our public lands than they already have. The thing is, companies can punch a hole in the ground regardless of the market. They do this to prepare to start hauling ore to a processing mill the moment uranium prices swing in their favor. And that hole in the ground is no small deal. 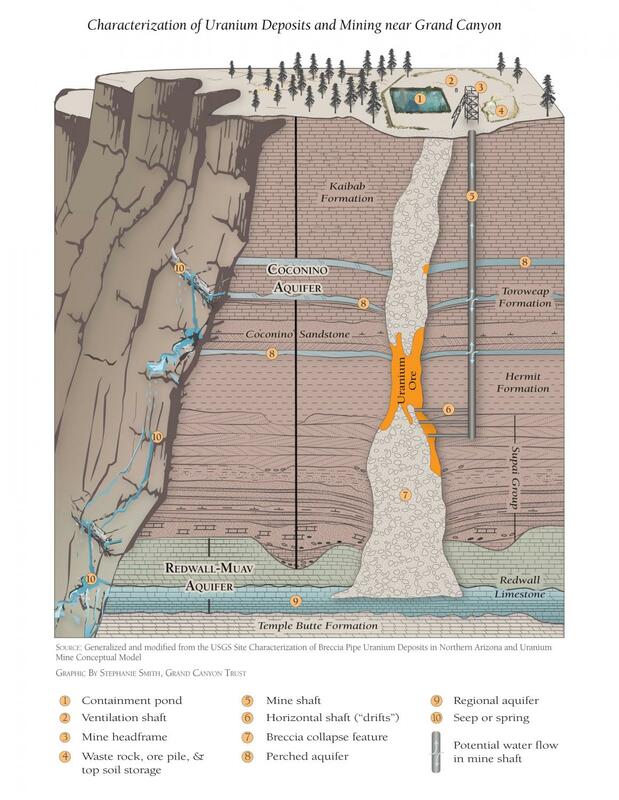 As the mine shaft cuts through layers of rock, and sometimes through aquifers, water from the surface or from the ground can come into contact with previously undisturbed uranium. Since uranium is incredibly soluble in water, it will travel wherever that water can take it. The mine shaft effectively becomes a potential conduit for contamination before a single pound of ore has ever left the site. 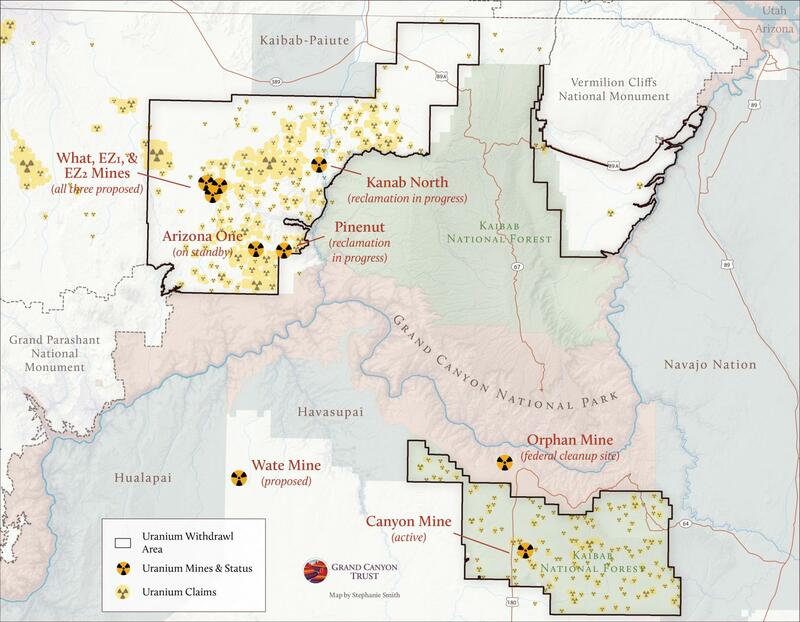 This contamination potential is already present at Canyon Mine south of the Grand Canyon. The mine owner and operator, Energy Fuels Resources, has been experiencing water inflow to the mine shaft at least since the winter of 2016-2017. And to date, the necessary steps have not been taken to ensure water isn’t seeping out of the mine shaft. For many, common sense dictates that when the cost of something is higher than the benefit it delivers, that something isn’t worth it. But maybe for the executives of private companies who stand to make money from mineral exploitation, the health and financial price of the legacy left behind is easier to ignore since they’re unlikely to be the ones to pay it. As Americans, we are the guarantors of private mining companies’ risk-taking and we have to draw the line.